Yes, I started a new project. Yes, I said I was going to finish the last one. Yes, I said it was for real this time. I just can’t help myself. I am beholden to no one but myself. The joys and freedom of hobby developing are mine, and I embrace them tightly! Yes, we named him Wizzy Gizzard. He lives in New York. Lady Liberty seems un-amused. 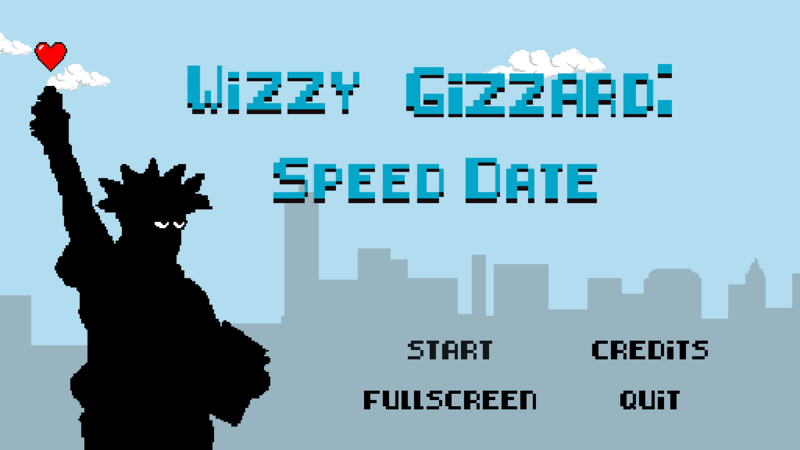 Wizzy Gizzard is old, living in New York City, and still looking for love. Today is his lucky day as there is a speed dating session that just started at Love Diner. 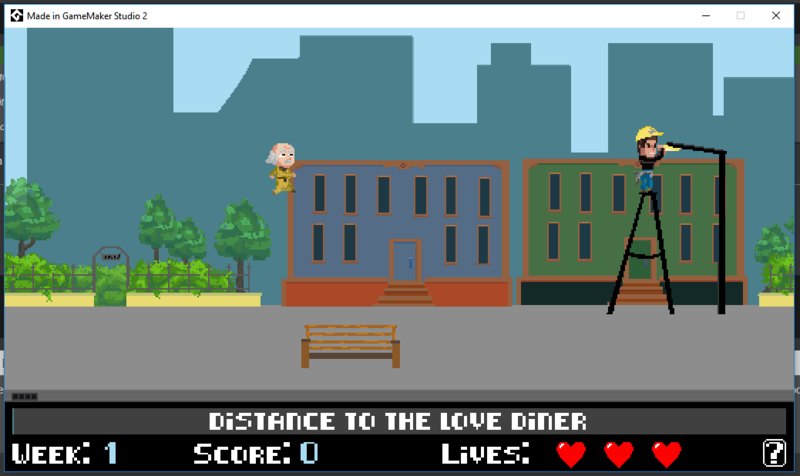 Overcome all the odds by jumping over the obstacles in his path and get him to the Love Diner. Will he find love? You will just have to play the game to find out! Have fun! The game is a side-scrolling runner, much like an endless runner, but there is an end to the level — the Love Diner. As he’s running along the buildings in the background go by, and obstacles appear in his path that he must jump over. (He’s a spry old elf.) When he reaches the diner, the cutscene of the date happens and the level’s score is tallied up. There are 10 levels called ‘weeks’ in the game to portray a new date for each week. Here’s a gameplay shot where Wizzy is jumping over a bench…. This game is very close to complete. There are just a few things I want to polish up and perhaps a few features to add, then I’ll be throwing this out there on itch.io, or something. Then, it’s back to my SpaceTrek game. Maybe. Anyway, I have some sad news to announce. If you’ve been following along, you may have noticed it’s been a while since my last post. In fact, it’s been 15 days. (Half a month! Holy cow!) That’s what entering a game jam does to your productivity and workflow on a personal project. It brings it to a screeching halt. Let that be a warning to you, if you are a fellow aspiring game developer. Game jams are fun, but they have a way of barging in and taking over. I created shelf items! Yay! I revamped the boring-looking art a little bit, too. I’ll explain the shelves in a minute, but first I’ll tell you what happened. But then I found “Supermarket Tycoon Prototype” and struck gold! This was very close to what I was envisioning. After watching the video, and reading the info and comments, I found the game on steam. It took a bit of doing since I’m not as familiar with Steam as I probably should be, but I was able to find it and actually play it. I have to say, Toby Kellaway (the game’s author) shows brilliance in this game, in my opinion. It was inspiring. Kellaway’s use of color and light-hearted character sprites heavily influenced the change in my art’s direction. I don’t know if I’ll keep the character this way (since I’d like to keep the overhead view constant), but it sure has an appealing look to me. I am definitely going to be using the color coding of shelf categories. If you notice in the gif above, I was able to give each shelf 30 items. (The game speed and movement speed was sped up for testing/debugging purposes.) These items are arranged in 10 rows of 3. The shopper chooses a shelf from which to get an item (randomly, at this time), takes one item from a randomly chosen row, then chooses the next shelf he will visit. Each shelf has its own 3D array. So when the shopper takes an item, it subtracts 1 from the quantity in that row, and adds 1 to the face position (product facing). This way, later in development of the game, I can have the employee come along to face the shelves and/or fill it with more items by easily manipulating this code. The drawing of the shelves and items use these arrays to position everything. I surprised myself when I got it all working.